Vanilla Flavor Is Now Available. New Chocolate-Vanilla Combo Pack Available. Simplify your nutrition with Shakeology® an ultra-premium nutritional health shake that provides the widest array of superfoods, vitamins, and minerals from around the world. Each shake helps you increase energy, become more regular, lose weight, and feel great. The only non-vegetarian ingredient is whey protein, which comes from milk. With what kind of protein is it made? The primary source of protein is from whey, which comes from milk. Whey is one of the most bioavailable protein sources. Translation: it rapidly gets to work on repairing your muscles and the amino acids are easily absorbed and used by your body. Is the whey protein antibiotic free? Shakeology contains no caffeine. It does contain green tea extract, but the caffeine has been removed. There is no food coloring. How is one green and the other brown? The ingredients (herbal powders, grass powders, vegetable powders, spirulina, chlorella, plus some of the fruit and berry powders) make the color green. The base of chocolate blend is also green, but the chocolate and cocoa powders turn the color "chocolate." We have put every effort into making sure that these ingredients do not contain pesticides, are not destroyed in processing, are produced using the best of fair trade practices, and have many of the benefits of what is considered "organic." So you might ask, "Why isn't it 'certified organic'?" The experience of our development team has shown that sometimes certified organic does not necessarily translate to higher quality. Certifying something can simply jack up the price, especially with ingredients of this quality and quantity. So we decided to focus on making sure the quality and integrity of the product lives up to the promise, without asking you to pay the premium it would cost for us to say it with a stamp of approval from a certification lab. Shakeology mentions "whole-food ingredients"what does this mean? How can it be possible when it's ground to a powder? Shakeology uses several whole-food sources of nutrients, rather than using only synthetic extracts or isolates (like some multivitamin pills). The benefit of whole-food derived ingredients is that the nutrients are preserved as close to their natural state as possible and are therefore delivered to your body in the most holistic way possible. Your body will better absorb and more efficiently use the nutrients from whole-food sources. The process of converting a food from its natural state to a powder, if done incorrectly, can destroy the nutrients in that food. With Shakeology, we ensure the highest levels of nutrients are preserved through strict temperature-controlled drying and processing. Why is there fructose in Shakeology? To give Shakeology its great taste and for a balanced, well-rounded macro nutrient profile we've used fructose. Fructose is a natural sugar found in fruit and some vegetables. The good thing about fructose--as opposed to glucose (table sugar) or high-fructose corn syrup (chemically altered sugar)-- is that it is very low on the glycemic index (GI). This means that your body sends it directly to the liver for absorption, which minimizes its impact on insulin and blood sugar levels. The fructose in Shakeology is from non-GMO (not genetically-modified) sources and is processed cleanly in GMP-certified (Good Manufacturing Practice) facilities. Is it OK to drink more than one shake per day? Or to replace more than one meal per day? Yes, but it is not recommended to replace more than 2 meals per day. Can I drink this right before a workout? Shakeology would be a better option than a full meal prior to working out. However, if it's immediately before a workout, you'd be better served by something with more sugar and less fiber for rapid absorption, su as Results and Recovery Formula or Meal Replacement. Can I drink this right after a workout? Again, it's better than many other options available but less perfect than something designed primarily for this purpose, such as Results and Recovery Formula. Can I mix this in with food I'm cooking/baking? 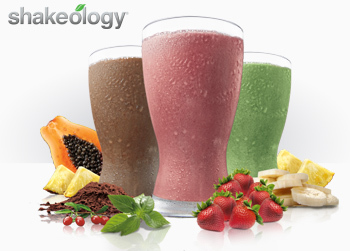 Cooking or heating Shakeology would destroy many of the nutrients in Shakeology and upset the nutrient balance. It's highly recommended that you drink it at room temperature or cooler. Do I use a full scoop or just up to the line? Use a full scoop to get the recommended serving (40 grams for Greenberry and 48 grams for Chocolate). Should I continue to take ActiVit® or other multivitamins along with Shakeology? Because of the way Shakeology is formulated, one shake pretty much covers your body's normal daily requirement for vitamins and minerals. However, if you're following a recommended exercise routine, your body is likely using up those nutrients at a faster rate. For example, if you're doing P90X® or ChaLEAN Extreme®hard-charging routines that burn more calories along with vitamins and mineralsyou may need some additional supplementation, like ActiVit. Due to the digestive enzymes in Shakeology, taking ActiVit at the same time you drink Shakeology will help your body to better absorb all the nutrients. Can I take Shakeology and P90X Peak Health Formula Vitamins? If you are using P90X Peak Health Formula vitamins, then only 1 serving/scoop of Shakeology is recommended per day. If you are taking any other supplements in addition to Shakeology and P90X Peak Health Formula vitamins, then watch your total intake to ensure you do not exceed Tolerable Upper Intake Levels for copper, magnesium, manganese, and zinc. The Tolerable Upper Intake Level for copper is 10mg/day, for magnesium 350 mg/day, for manganese 11 mg/day, and for zinc 40mg/day. I already have some Meal Replacement. Should I throw it out and switch to Shakeology? You don't have to throw it out. Meal Replacement is a high-quality protein shake. Shakeology offers a wide array of nutrients on top of protein. Because Meal Replacement has higher sugar content and less fiber, a good time to use it is around the time you are exercising (Results and Recovery is also good for this purpose). Shakeology is a better option for a meal that's at least 2 hours before a workout or 1 hour afterwards. Can I take Shakeology and Results and Recovery Formula? Yes, but not together! Results and Recovery Formula should only be taken during or after exercise, when you've been exhausting your body's blood sugar. At any other time, Shakeology would be your preferred option. Should I still take an omega supplement? While the flax seed, chia seeds and sacha inchi in Shakeology provide some omega-3 fatty acids, it is still recommended to take the Core Omega-3 supplement to meet your daily requirement. The recommended daily allowance of calcium is 1,200mg/day for women and 1,500mg/day for post-menopausal women. Shakeology provides 500mg of calcium, so it is recommended to supplement with Core Cal-Mag to meet the daily recommended allowance. Due to the digestive enzymes in Shakeology, taking Core Cal-Mag at the same time you drink Shakeology will help your body to better absorb the nutrients. Is it safe for people with diabetes? Since needs vary for each person with diabetes, it is recommended to check with your doctor first. However, since Shakeology is a low-caloric meal replacement, with a lower glycemic index than most meals, it should be acceptable for most people with diabetes. Can I give it to my kids? Is it safe for kids? Since the needs of every child may vary, please check with your pediatrician. However, since Shakeology is a healthy drink with low sugar and a wide variety of nutrients, it is a much healthier option than many other drinks or snacks on the market and should be appropriate for most children over the age of 6. You may want to start out with a smaller serving size until you are sure of the child's tolerance. It is not recommended to give as a meal replacement for children younger than six years old without first checking with your pediatrician. Is it safe for celiacs or people with gluten allergies? After extensive testing, Shakeology has been found to be 100% gluten-free. As such, Shakeology should be an appropriate snack or meal for people suffering from gluten allergies or celiac disease. However, since individual allergies and conditions vary, it is recommended to test a small dose first before proceeding with a full serving. While Shakeology has been tested as safe for most people, you should always consult with your physician if you are on any medication (especially heart medication, since Shakeology contains Vitamin K1) or if you have any other unique health conditions. Because needs vary for each person with lactose-intolerance, it is recommended you check with your doctor first. However, the whey protein in Shakeology is whey protein isolate , which is over 90% pure protein leaving only 10% of the ingredient, or 1.5g, where some lactose can be found. In addition, Shakeology is loaded with digestive enzymesand Lactase is one of them. Lactase is the enzyme that breaks down lactose and is found in over the counter products like Lactaid ®. So, given that Shakeology is made with whey protein isolate and includes Lactase means that it may have a higher likelihood of being acceptable for most people with lactose-intolerance. It's recommended that someone with lactose-intolerance start with a small dose of Shakeology, monitor their body's reaction and, if tolerant, slowly build up to a full dose or take a half-dose at two separate times during the day. I've tried Shakeology and seem to be experiencing digestive discomfort. Does this mean Shakeology doesn't work for me? Not at all! For some people, experiencing digestive sensitivities is a normal part of the cleansing process. It just means that your body is working hard to eliminate the toxins built up in your system over several years. It will not get flushed out in one day! Help your body to clean itself out more gently by reducing your dosage to a scoop once a day. Slowly build up to a scoop twice per day as your tolerance increases. You may then work up to one full scoop per day. (Although it is perfectly fine to continue to use Shakeology as 2 small snacks (at a scoop each) throughout your day.) For some people, this process could take as long as three months. Since every body reacts differently, if you continue to experience digestive problems at lower dosages, please consult your doctor. Does this mean I don't have to eat any more veggies? Unfortunately, no. Fresh fruits and vegetables will always be important for a healthy, balanced diet. Shakeology can help you fill in the nutritional gaps that occur when you're too busy to eat the right balance of fruits and veggies. Plus, it's much easier to tuck into a purse or backpack than a head of lettuce! Why does the chocolate have more protein? The serving size for chocolate is 8 grams higher than for greenberry. The extra ingredients added for the chocolate blend (mostly chocolate powder and cocoa powder) add an additional 2 grams of protein for the serving size. You can get free shipping on your Shakeology purchase if you enroll in our Home Direct Program. Home Direct is a customer convenience program where a new order is automatically generated each month for the product you choose. This order is billed to the credit card you provide and then shipped to you. Once you enroll in our Home Direct Program (Recurring Order) there is no obligation to continue . You can edit (billing & frequency information), review and / or cancel your Home Direct Program (Recurring Order) at any time. How do I place a Home Direct order? 1- Search for the product you want to enroll as Home Direct. 3- Enter the Quantity you want. (This is the quantity you will receive for each auto-shipment). 4- Click Add to Cart. 5- You will be able to see the frequency in which the product will be billed & sent out to you in the view cart page. 6- Click the Checkout button. 7- Complete your order by using a valid credit card, and your first order will be placed today. You MUST pay by credit card to use the Home-Direct Program. 8- Confirm by logging into the My Account page. On the Recurring Orders section click the "View Details" link of the order in question. 9- Relax. Your next order will automatically be placed according to the frequency you chose. You will receive an order confirmation email when it submits successfully, and a shipping confirmation email with tracking when your order ships. Your credit card will be charged the day the recurring orders is automatically and successfully submitted. How is the cost calculated for subsequent orders? All subsequent orders will be automatically charged to the credit card that was provided for the same amount that was charged on the original order. We will notify you of any changes in the cost of the product and we will not bill your card until we receive written consent of approval of the increase of the cost of the auto-billing amount. What will the product quantity on the recurring order be? The quantity for a product on Home Direct orders will match the quantity on your original order. You can confirm the details of your recurring order at any time by viewing the information in your My Account page on our website. How do I cancel a Home Direct order? 1-	Log into your account. 2-	Under the Recurring order section, locate the recurring order that you wish to cancel. 3-	Click on the "View Details" link of the recurring order that you wish to cancel. 4-	You will be prompted to a screen with details of the order in question. 5-	Click on the "Cancel This Order" Button located on the top right hand side corner of the order detail page. 6-	Please confirm that you want to cancel the order by clicking "OK" on the order cancellation confirmation pop up. When can I cancel my Home Direct order? You can cancel your Home Direct order (Recurring Order) anytime as long as it is within 5 business days of your next order billing date.